Now that the weather is beginning to cooperate and temperatures are warming up, be cautious about sunscald developing on the stems of transplants, especially those being set onto black plastic mulch. With a little planning ahead potential losses to sunscald injury can reduced significantly. Sunscald injury on stems of newly transplanted pepper seedlings caused by stems laying against edges of black plastic mulch on hot, sunny days. A transplant coming straight out of the greenhouse and directly into the field has not been exposed to much direct sunlight. Add that with black plastic mulch and you have a lot of heat aim directly at the tender tissue of the transplant. All transplants should have some time to harden-off outside the greenhouse before going into the field, a day or two, is better than none at all, the longer the better if time and space allow. 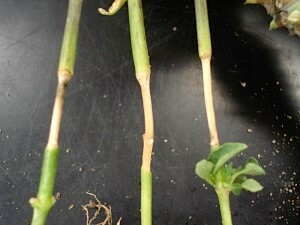 Sunscald typically appears as the slow bleaching out of the stem that will typically appear only on one side. Often this starts to appear right where the stem meets the black plastic mulch. In many cases if the stem is touching the mulch, the sunburn will start there and the transplant will begin to fall over as if the stem was broken. When transplanting, make sure the holes in the plastic are wide enough to keep the stem from coming into contact with it. In some cases growers will fill in the transplant hole with soil to help keep the transplant upright before between-row herbicides are applied. ‘Leggy’ transplants that lay across plastic mulch and even those transplanted onto bare ground are prone to sunscald injury.